I’ve always wanted to learn how to make a Christmas wreath. But I’ve never found a workshop that I can afford, or get to, or that doesn’t clash with work or another Christmas activity. 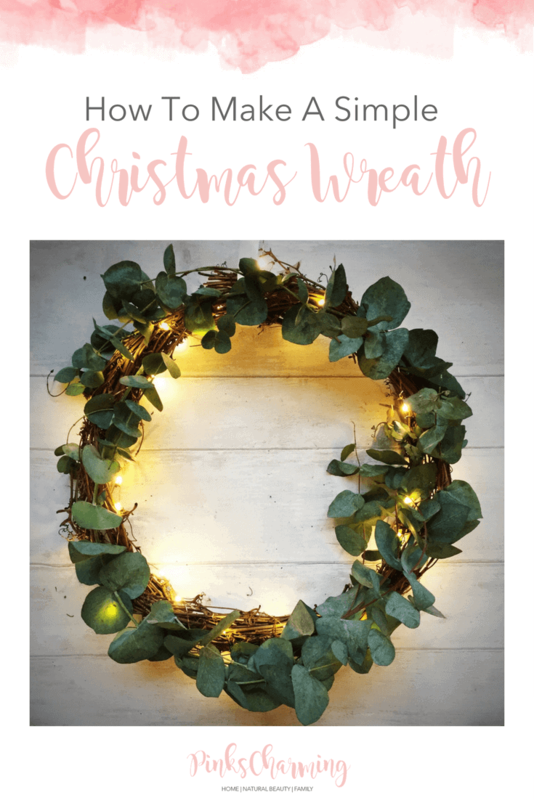 So this year I am taking matters into my own hands, and making a simple Christmas wreath myself! I am certainly no expert, but I have been learning how to arrange flowers, and that has given me the confidence to just have a go! A wreath. Mine is left over from our wedding, nearly 10 years ago – thanks Dad for storing it in the loft for all this time! I think I got it from Hobbycraft, or Amazon, like this nice wicker one for £2.50 plus P and P.
Fairy lights. I used copper wire ones similar to these but IKEA have some as do Wikos etc. If your wreath is going outside, make sure you get lights that are OK for outdoor use. Greenery. You can use holly, or whatever you fancy. I chose eucalyptus from our local florist as I love the smell. I used two lengths and they were a pound each. Florist’s wire. I got these short sections rather than a roll, as I thought it would be easier to control. I cut them into three shorter strips to make it neater. Ribbon. I already had some white ribbon, but you can choose whatever shade you like, of course. COST: Around ten pounds. Not bad! Step 1: Decide where you’ll be putting the wreath. If you don’t have a hook already, stick a Command hook on the back of the door, upside down and leave to ‘set’ for a few hours at least. 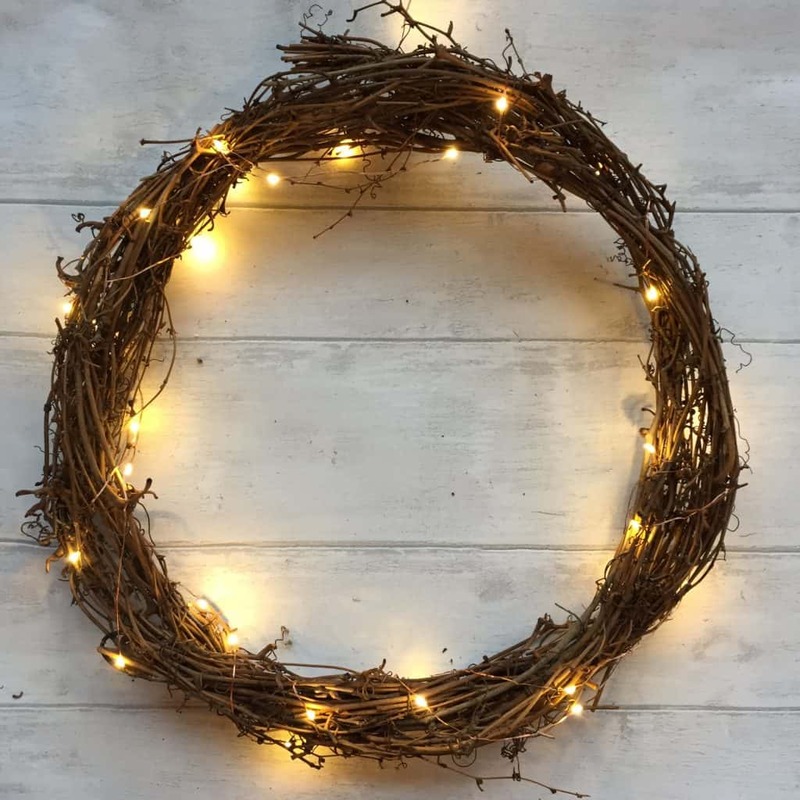 Step 2: Wrap your fairy lights around your wreath. I was tempted to leave the wreath like this as it looks pretty already. But I wanted to add the greenery to see how it would look. Make sure you have enough cable left so that the battery pack will be hidden on the inside of the door. Step 3: Attach a length of ribbon. 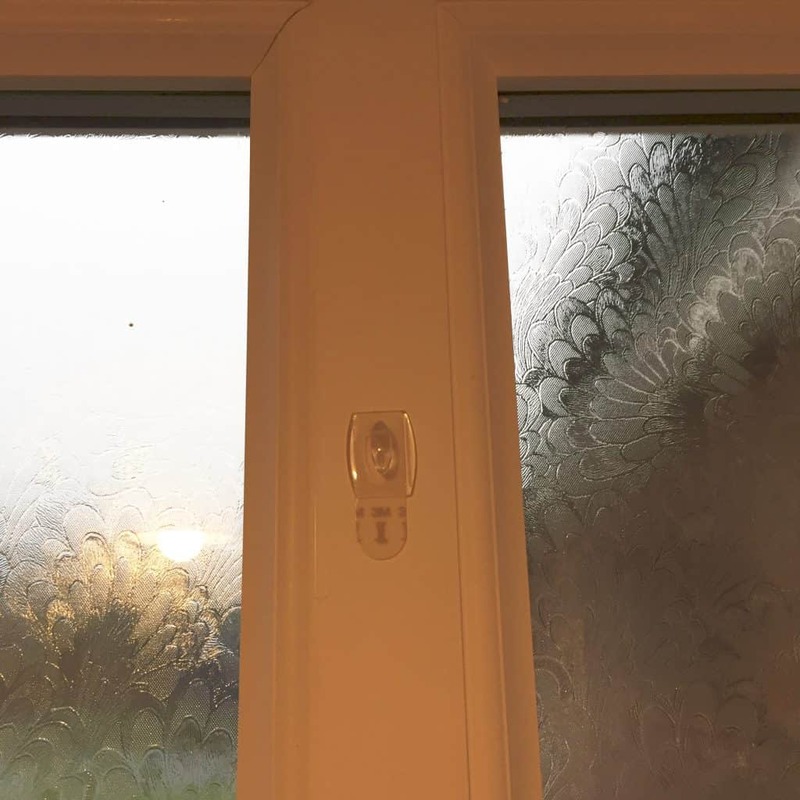 Leave it long enough to drape over the back of your door – you can always cut off the end if it’s too long. I added a bow to mine but then took it off again as I wanted it to be simple. 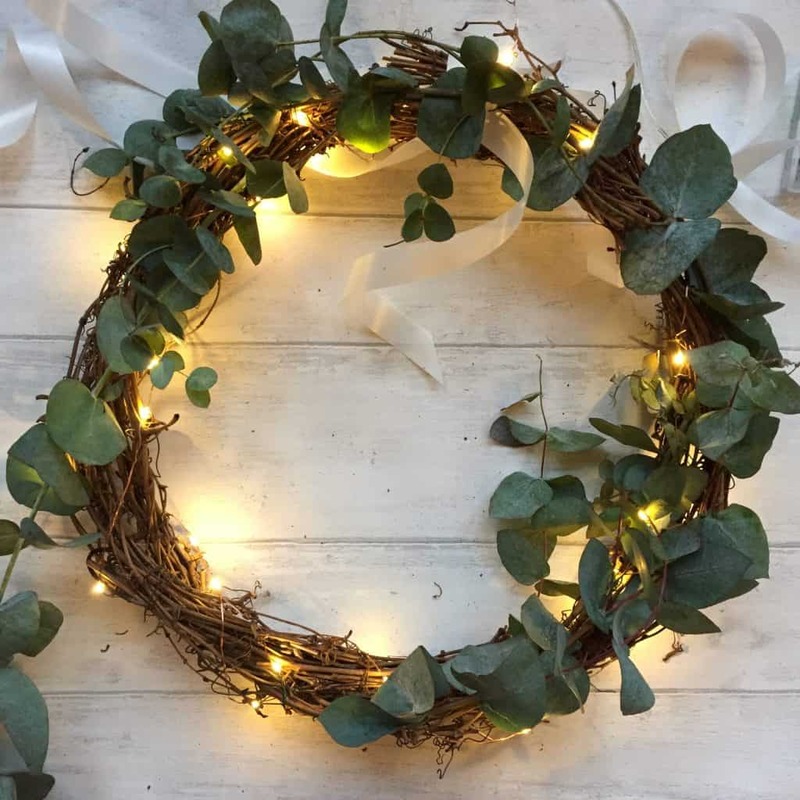 Wrap the ribbon around the top of the wreath at the same point that you light cable trails up. I wrapped a strand of floristry wire around it too, to make sure it didn’t untie. Step 4: Add your greenery. 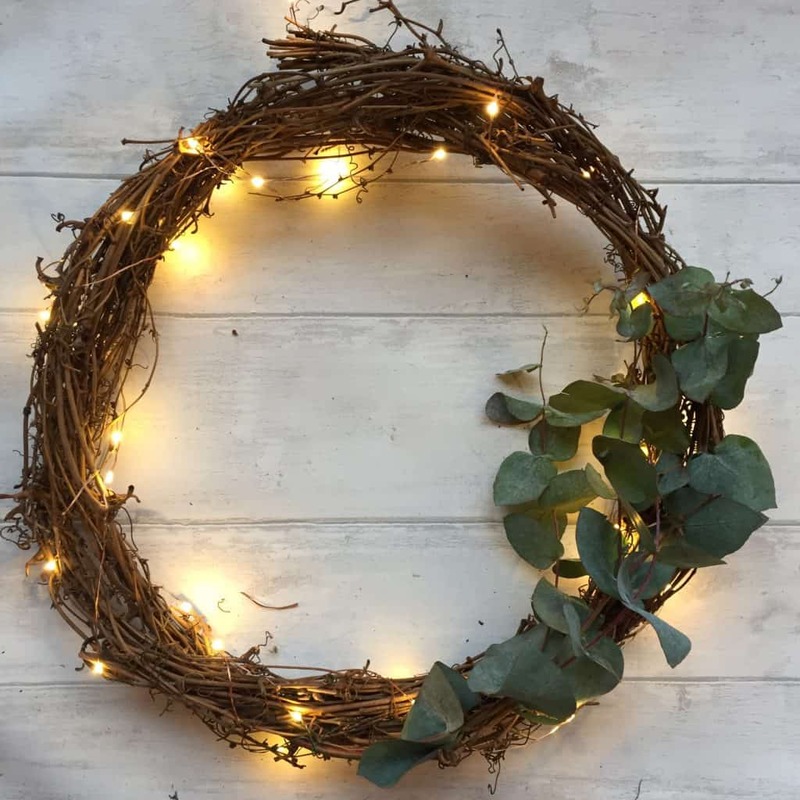 Starting at the bottom of the wreath, poke the end of your greenery in between the wicker strands of your wreath. 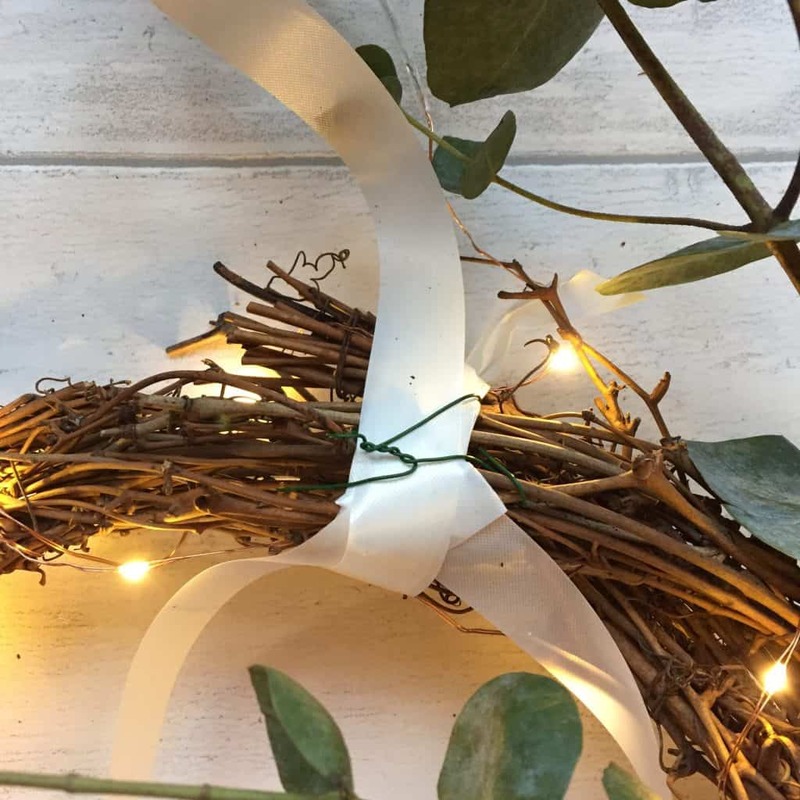 Lay it so that it follows the curve of the wreath, and use floristry wire to attach the stems. If you put them just below where the leaves start, they’ll be hidden. 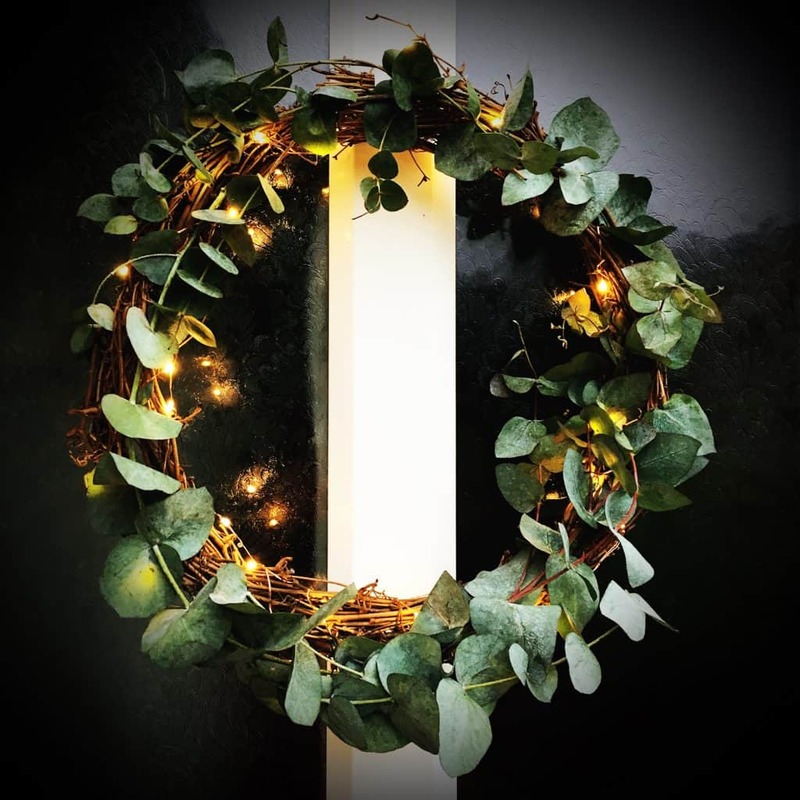 I like the way eucalyptus has fronds that trail out to make it look more casual, but if you prefer something neater, just tuck them in, or use more floristry wire. Step 5: Add more greenery! Continue adding more strands of greenery, working around the wreath in the same direction. When your final piece over laps the first one, it will cover any ends. Add in any shorter strands of greenery if you have any gaps. I don’t mind the wicker showing through, as I wanted a rustic look, but you can carry on and cover it completely if you prefer. 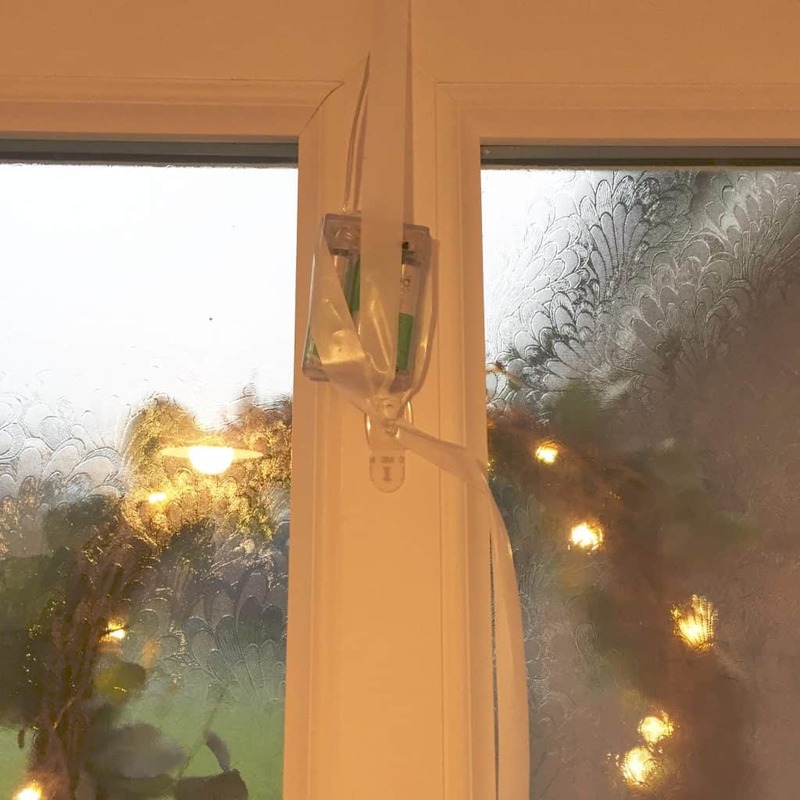 Step 6: Hang your simple Christmas wreath. Finally, position your wreath on the front of your door, and put the battery pack and ribbon over the top of the door. Make sure your ribbon is covering the cable, and then just wrap your ribbon a few times around the hook to secure. Don’t forget to turn the lights off if you go out, and at night! Step 7: Stand back and admire your Christmas wreath! Take a photo and post it to Instagram – please tag me in it if you do, I’d love to see what you come up with! I’m @pinkscharming on Instagram, do come over and see what I get up to. 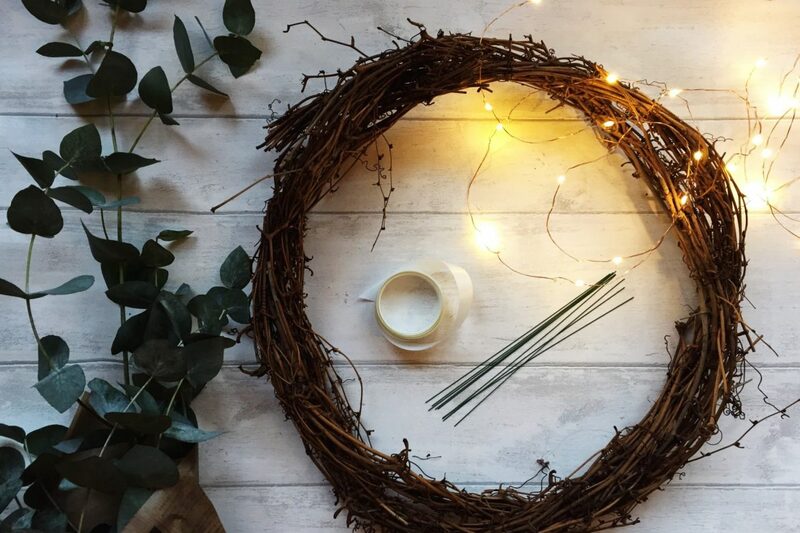 If you like a more fancy Christmas wreath you could add berries, faux snow spray, holly, baubles, other Christmas decorations, a strand or beads, or pine cones. The only limit is your imagination! 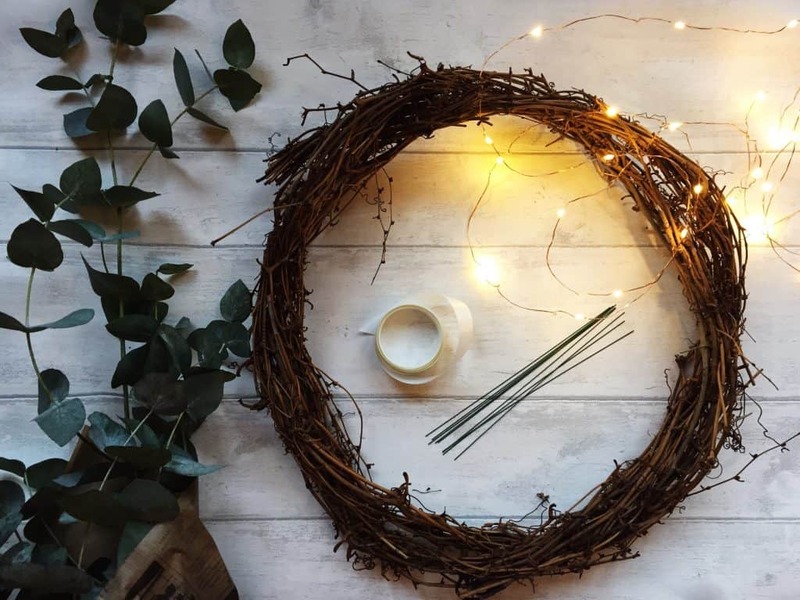 Will you be making my simple Christmas wreath? Let me know if you’ve ever attempted something like this. I had no idea if mine would work but I’m really pleased with it! Why not pin this tutorial for later? 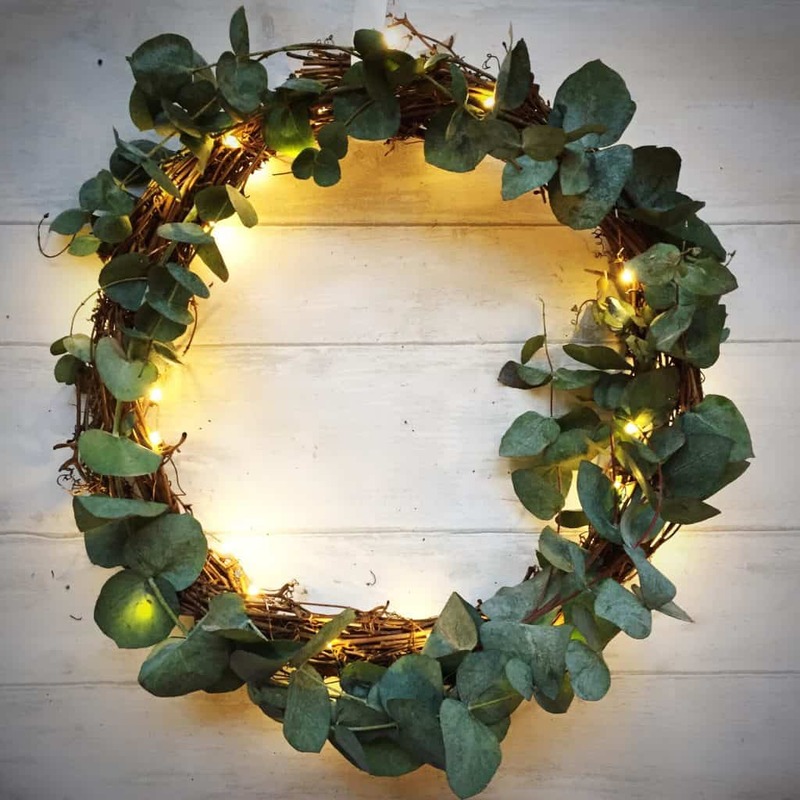 I love this so much – I’ve always wanted a wreath, but they are all far more expensive than I’m willing to spend, as our front door is down a passageway and we’d be the only ones who saw it!! I’m going to have a go at creating my own now, thanks for the inspiration! I love the fact that you’ve re-used the wreath-base from your wedding. What a magical thing to do – reliving your happy memories to make your future Christmases even more special! This looks lovely Becky! Such a simple idea and so effective.